As an iPhone owner in the U.S. you can take advantage of the many Wi-Fi hotspots AT&T maintains around the country, all for free. That’s nice, but the process for logging into the hotspots can often be irritating: first you have to type in your phone number, then wait for a text message, then click a link in the text message. It’s kind of pain when you just want to quickly jump onto the Wi-Fi to check something. But grab Devicescape’s Easy Wi-Fi for AT&T (iTunes link) and you can cut through the convoluted process lot a hot knife through butter. Simply input your 10-digit AT&T telephone number into the app's preferences, then fire up the application next time you want to jump on an AT&T network; Easy Wi-Fi will take care of the rest for you. Of course, you need to be an AT&T subscriber in order to get free access to the hotspots in the first place, so iPhone owners visiting from outside the U.S. are unfortunately out of luck. The program, which can also simplify access to a number of free hotspots that require you to click through a page, is free for the next for the next few days, but as of December 5th, it will jump to $2. 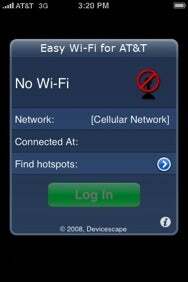 Devicescape also offers a $2 version of the Easy Wi-Fi program that helps remember usernames and passwords for other Wi-Fi hotspot networks that you might access; owners of that program can use it for logging on to AT&T’s hotspots as well.